^ a b Fetter, Steve; Lewis, George N.; Gronlund, Lisbeth (January 28, 1993). “Why were Casualties so low?”. Nature (London: Nature Publishing Group) 361: 293 - 296. http://drum.lib.umd.edu/bitstream/1903/4282/1/1993-Nature-Scud.pdf. ^ "The Unfinished War: A Decade Since Desert Storm". CNN In-Depth Specials. 2001. ^ a b Robert Fisk, The Great War For Civilisation;The Conquest of the Middle East (Fourth Estate, 2005), p.853. ^ Keaney, Thomas; Eliot A. Cohen (1993). Gulf War Air Power Survey. United States Dept. of the Air Force. ISBN 0-16-041950-6. 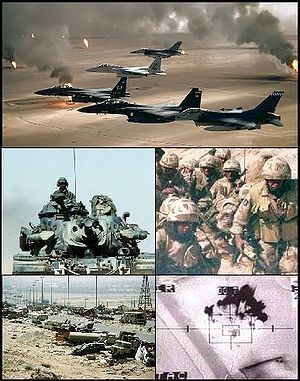 ^ “Persian Gulf War - MSN Encarta”. Persian Gulf War - MSN Encarta. 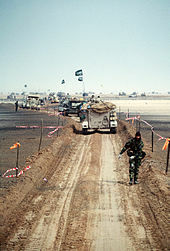 http://encarta.msn.com/encyclopedia_761551555_2/Arabian_Gulf_War.html. 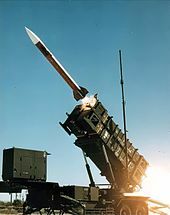 ^ Is an Armament Sickening U.S. Soldiers? ^ The Associated Press. "Soldier Reported Dead Shows Up at Parents' Doorstep." 22 March 1991. ^ Miller, Judith. "Syria Plans to Double Gulf Force." The New York Times, 27 March 1991. ^ Husain, T. (1995). Kuwaiti Oil Fires:Regional Environmental Perspectives. Oxford: BPC Wheatons Ltd. pp. 68. ^ Leckie, Robert (1998). The Wars of America. Castle Books. ^ a b How much did the Gulf War cost the US? ^ Jehl, Douglas (December 27, 2001). "A Nation Challenged:Holy war lured Saudis as rulers looked away". The New York Times. pp. A1, B4. Retrieved September 5, 2009. ^ 英: the "100-hour war"